huge hangars at the Griffiss Business and Technology Park. 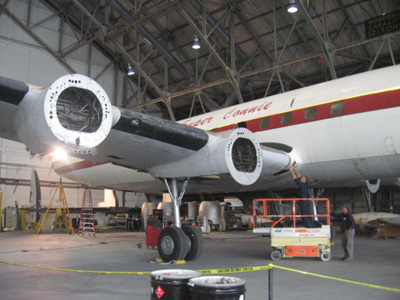 There’s good news and bad news for fans of the “Super Connie,” the antique Super Constellation airplane that is undergoing restoration at the Empire Aero Center in Rome, NY. The good news is that she is out of the weather and is getting a lot of TLC now in a heated hangar. “I thought we might beat the snow, and we did, just barely,” said Kevin Lacey, project manager. Though battered by years of neglect and careless handling, Connie managed to survive one last wind and rain storm on Oct. 26 before she was finally moved into the hangar. Lacey and a small crew worked a 16-hour-shift on that day to get the wings, nose gear and landing gear all attached to the 1954 Lockheed Super Constellation so she could be towed indoors. Now she’s up and standing on her own in one of Empire Aero Center’s huge hangars at the Griffiss Business and Technology Park. The bad news is that Lacey and Tim Buchholz, the lead mechanic, are beginning to make a detailed assessment of damage to the 53-year-old airplane. Lacey pointed to arbitrary holes that had been punched in the belly at some point. In addition to bent ribs on the underside, he compiled a list of large dents and dings, signs of corrosion and rust along the ribs, skin and interior compartments. Also, two antenna on the underside are inexplicably missing. The Connie arrived at Empire Aero Center (EAC) from Toronto last June under a contract with the Museum of Flight in Seattle, WA. The hulk sat on its belly in front of the EAC hangar for months. Then on Friday, Oct. 26, EAC brought in two 50-ton rigs from Rig All in Frankfort, NY, to begin the process of the Connie’s restoration. The plane was lifted off the ground and placed on temporary shorings. The rebuilt landing gear and nose gear were attached along with the wings. were cut in the bottom to accommodate plumbing and wiring. 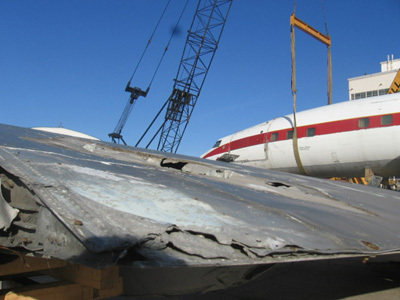 Complete restoration of the Connie won’t be achieved until late spring, possibly the end of May. 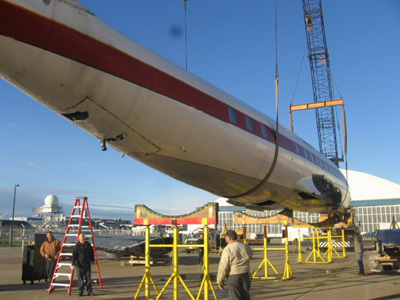 Then she will be disassembled again, trucked to the museum in Seattle, reassembled and eventually put on static display. The next item on the agenda is to strip the Connie of her old paint and repaint her in the colors of Trans Canada Airlines, a forerunner of Air Canada, who originally commissioned the plane. Meanwhile, structures mechanic Wendy Pickens is working on the Constellation’s distinctive three-finned tail. She’s removing the old Dacron fabric that used to cover a portion of the tail. She is replacing it with aluminum skin that is riveted into place with a pneumatic gun. Lacey noticed a severe break at the joint that connects the tail fin to its base at a 90-degree angle, which he said was apparently caused years ago when a chain was wrapped around it in order to tow it. He also discovered that the mounting points that connect the 18-foot wings to the fuselage have been broken off, so it has delayed the reattachment of the wings. He climbed up a ladder to peer into the baggage compartment where EAC mechanic Tom Biscosi was taking out the floor mats to inspect the floor. Lacey said this section forward toward the nose shows extreme wear and tear. off from decades of mishandling. This delayed the reattachment of the wings. Even though the Connie is self-supporting, the steel landing gear is covered by rust, and EAC is using a tail stand as an added measure of safety. Lacey is in frequent contact with Tom Cathcart, director of the Museum of Aviation, and Bob Bogash, a former pilot who is an expert on the Constellation and is volunteering his time at the museum. Bogash also maintains a website dedicated to Connie with reports and photos from EAC. Lacey and a crew of five, compile regular reports for EAC’s Vice-President of Maintenance Randy Buol. In turn, he submits detailed reports to the museum so they can approve and pay for the repair work in installments. Lacey did not wish to divulge the cost of the total contract. The scale of the damage and the age of the plane can make repairs a daunting challenge, but Lacey and Buchholz are beginning to enjoy the complexity of this mechanical puzzle.